Paranoia and anxiety are out to get you. A radical shift in your Praxis Core Math practice is necessary if you suffer from even a single iota of terrible test anxiety. If not, you could end up falling victim to this test score killer. Only a Praxis Core practice test pdf or interactive Praxis Core Math study guide can break the sub-conscience programming causing your test anxiety. You can’t exactly stop your heart from pounding out of your chest or your palms from dripping with sweat. You can’t tell yourself to stop feeling queasy. You can’t silence that little voice in the back of your head that keeps insisting that no matter which selected response answer choice you select, you’re wrong. And no matter what steps you take to beat it, Praxis Core Mathematics paranoia and anxiety are lurking around every corner, waiting to trip you up when you least expect it. 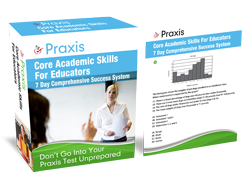 Most Praxis Core Academic Skills for Educators math study guide authors ignore test anxiety. Due to the fact many such authors are even oblivious to the actual academic skills measured on this test, they are unaware that text anxiety is a crushing issue for today’s bright and talented teachers. But we know better – and we know that you deserve better. It’s not an inevitable part of your Praxis Core Math practice experience. It’s not a common occurrence that every test taker has to deal with. It’s a very real and very debilitating problem – one that’s responsible for halting the careers of thousands of talented, enthusiastic and dedicated teachers. And I’ve finally decided that it’s time to help you fight back. Praxis Core study nervousness, worry and anxiety might feel like an inevitable part of the experience – like with all standardized tests – but that doesn’t mean you have to put up with them. After all, when you’re knee-deep in Praxis Core Math practice tests and study guides. The last thing you want to struggle with is a feeling that no matter what you do, you’re bound to fail the test even before the test dates themselves. So what’s a savvy test taker like yourself to do? Simple: pay attention to these major anxiety triggers that are on a quest to undermine your ultimate performance! Whatever you do, stop looking for answer patterns in your answer sheet. You know exactly what I’m talking about here: If you see the letter C appearing too many times in a row, you decide to change it just to eliminate an apparent pattern. Listen up, Praxis Core Math test taker: All answer patterns on your Praxis Core testing are purely coincidental. So stop allowing them to undermine your testing confidence! Feel like the exam is a bit too easy? That’s a classic example of letting your low self-esteem undermine your test performance. Think about it: Why should answering questions quickly and without hesitation immediately translate into failure? More often than not, you probably knew the content. So stop sweating the small stuff – and start trusting in your abilities as a Praxis Core Mathematics master. There are plenty of other mathematics test prep tips and tricks to battle your paranoia before it takes hold of your test practice. And if you’re ready for the kind of Praxis Core Math practice test that translates into instant success, then get your hands on the tools you need now. I reveal how I discovered an escape route out of test anxiety and passed the Praxis Core Math.